National Rehabilitation Awareness Week occurs each September to honor therapists and therapy assistants. During the month of September and especially National Rehabilitation Awareness Week, we celebrate the rehabilitation professionals who all work together to make a difference in the lives of others. Therapists truly are some of the most highly caring and sensitive individuals who genuinely enjoy helping people. So, we want to say, “A BIG Thank You!” for the compassion, patience, and understanding you exhibit with your patients. In celebration of National Rehabilitation Awareness Week, we are offering a 25% discount on all of our PT, PTA, OT, OTA, and SLP CE packages. Use promo code REHAB to save! 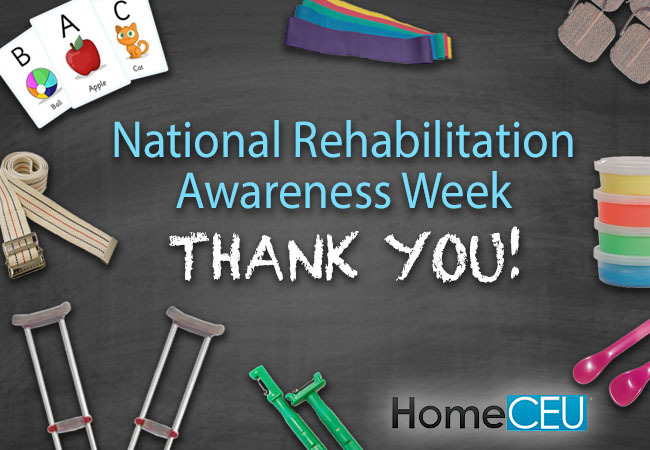 The first ever National Rehabilitation Awareness Week was started in 1976, with a small campaign by Allied Service in Scranton, Pennsylvania. Fast forward 40+ years, the campaign has grown into a national awareness initiative dedicated to the caring professionals who help patients achieve their goals every day! According to Forbes, physical therapy ranks among the top 10 “happiest jobs” in America. Many of today’s physical therapy techniques date back thousands of years. 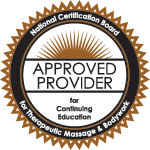 The first use of massage and hydrotherapy goes as far back as 460 BC. Physical therapy as a profession actually started during World War I as there was a need to take care of injured soldiers, and the first PTs during WWI were called “reconstruction aides”. Physical therapy began as a female-only profession. The initial physical therapy professional organization was called the American Women’s Physical Therapy Association and had 274 members. In 1922, the American Women’s Physical Therapy Association changed their name to the American Physiotherapy Association. Then in the 1940’s, the organization changed its name once again to the American Physical Therapy Association (APTA), whose members today include over 95,000 therapists in the U.S. alone. The demand for physical therapy increased in the late 1960s and 1970s. Schools could not graduate PTs fast enough during this time, so the career of physical therapy assistant was created. Occupational therapy techniques date back farther than PT. In 100 BC, a Greek physician named Asclepiades used OT techniques to treat mental illness. In 1917, the occupational therapy profession was founded by three men and three women. Like PTs, OTs treated injured soldiers in World War I and World War II. Today, over 30% of occupational therapists work in the pediatric field, but OTs did not actually work with children until the mid-20th century. In 1975, public schools began employing thousands of OTs to help disabled children. The American Occupational Therapy Association (AOTA) celebrated their 100-year anniversary in 2017. Their founding name was the National Society for the Promotion of Occupational Therapy. Today, membership includes over 63,000 occupational therapists, occupational therapy assistants, and students. The speech language pathology profession began in the 18th century in England. Many World War II soldiers suffered brain injuries and had resulting aphasia. Thus, the need for speech rehabilitation services attracted large numbers of men and women to the profession of speech therapy. The American Speech-Language-Hearing Association (ASHA) began in 1925 at a meeting of the National Association of Teachers of Speech in New York City. Since the establishment of the American Academy of Speech Correction in 1925, the association has changed its name four times, and formally became known as the American Speech-Language-Hearing Association in 1978. Today, ASHA membership includes over 198,000 speech therapists.